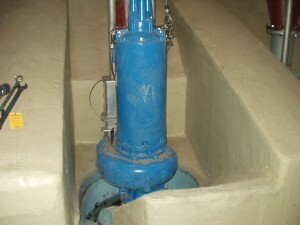 Consist of Fairbanks Nijhuis VTSH vertical turbine solids handling pump in a trench type wet well. Trench type wet wells for solids bearing liquids can be cleaned utilizing sump geometry to create a scouring hydraulic “jump” to clean both floating and settled solids. Frequency of cleaning cycles is dependent upon local conditions and is performed by the operator. Consisting of a Hidrostal screw centrifugal pump and a prerotation basin, geometry and gravity are the main working components in this unique pump station design. Every pump cycle creates a cleaning cycle automatically before it stops. Not only can this design significantly reduce maintenance costs but it can be used as a flow matching system to reduce the need for constant starts and stops during peak flows.